What is the best Japanese Sports Car? Originally, the automobile industry in Japan was formed in the early 20th century. First vehicles made by Japanese car manufacturers were copies of European and American cars. However, after the 1950s, the situation cardinally changed and made the beginning of something outstanding and more valuable for Eastern Asia’s history. Japanese sports cars started obtaining their unique and original form. Moreover, many car trophies were assigned to the cars of Japanese production. A long time ago Toyota was named Toyoda, and Mazda – Mazuda. After that, Japanese cars were named according to the American standard to hide their Asian origin. The number car manufacturer was Nissan with its top car model Nissan GT-R. This model can be easily called an icon for any fan of the Japanese car industry. Many modifications of this model allow final user choosing the most optimal style and design. The most powerful Japanese sports cars of Skyline class are equipped with the engine of up to 500 horsepower. If someone finds it too cool to have, there are shy car models, such as V-Spec (340HP) and M-Spec (280HP). All aggregates work using six-speed transmission. Japanese sports automobiles of Skyline series have an appropriate appearance with some aggression. They are also equipped with the best electronics. In other words, this is a dream, not a transportation vehicle. Another best sports car manufacturer in Japan is Datsun. Especially, their model Datsun 240Z. Datsun is a daughter company of Nissan and it is one of the top leaders in many ratings. Japanese sports cars of 240Z series are popular due to their good characteristics and democratic price policy. 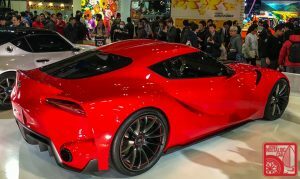 Toyota Supra – these sports cars are the most demanded cars in the international market. Despite the fact that these cars are very expensive, you can easily find fans of these cars in any country, except Venezuela. Car owners of these sports cars tell us that they like not only the car design or amazing characteristics but also the availability of modern electronics. Every owner of this car feels like the main hero of Fast and Furious. Honda NSX is different to others due to its original and unique design. In addition, it looks like a real sports car. The technical characteristics are also different regarding the model. However, car manufacturer no longer produces this model anymore. Therefore, many car owners use the engine, which was produced a decade ago. Despite the release date, this sports car can compete with other representatives of this segment. Mitsubishi Lancer Evolution is another sports car made by Japanese car manufacturers. The new Evolution is different from its oldest versions due to its developed control and the premastered front part of the vehicle. An attractive sports design, power pack, and democratic price policy continue satisfying Mitsubishi fans. Their last model exceeded all the expectations by providing a car owner with the best driving experience. Owners of these models say that they like not the only price, but also all the sports opportunities the Evolution has. In conclusion, Japanese car manufacturers use the latest technologies the government offers. The country of rising Sun is one of the technological countries all over the world. That is why their cars deserve every car owner attention.